Are you a year round heart lover, a seasonal fan, or a take-it-or-leave it kind of lover? It's a very nice style. These pieces are so pretty. Love your selection. Lovely sweaters. 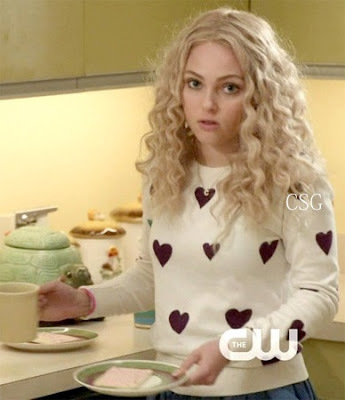 That sequin heart sweater is too cute! This is such a fun trend for V Day and all year. Have a great weekend! Uh oh I am in love with sweaters n. 2 and 3!! All these items look so lovely! those sunglasses are too cute! Def a must have. I feel like I am a seasonal fan. Thank you for being one of my followers this year. I just celebrated my blog's 1 year anniversary and wanted to express my appreciation! Hi Cathy, how are you? I am adoring the pink and red sweater at number 2, the adorable sunnies and pretty bag. Awesome picks! Loving hearts lately! Especially the sweaters -- so cute and cozy! Hope you have an amazing V-day Cathy! im into hearts alot more this year than any year, so these pics are great Cathy! I love #2! Have a great day! I am not usually a big fan either but those pieces are super cute!!! Great sets!! 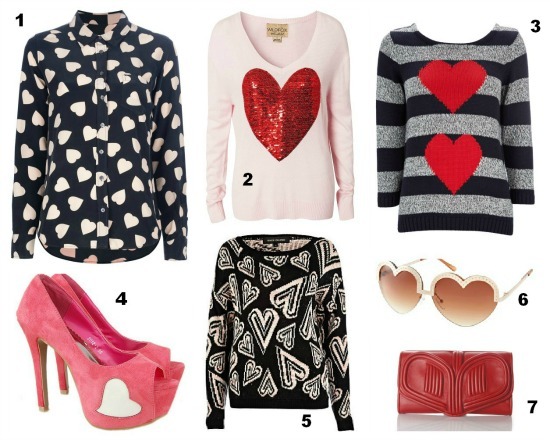 Love the heart sweater!! Hope you are having a wonderful day! PS. New post is up on my blog. Check it out whenever you get time! hi dear! thank you for visiting my blog and commenting...would you be interested in following each other? i <3 the wildfox jumper!